RUSH: So (shuffling papers), I just got an email from somebody sending me the latest Donald Trump tweet, and the person sending me the email said, “This is uncanny. Is he listening to you today?” So in the first hour of this program, I made mention of the fact that I love the idea in the Washington Post. They’ve got this very cutting story claiming that White House officials tried to pressure immigration authorities into releasing detained illegal aliens into sanctuary cities. “White House Proposed Releasing Immigrant Detainees in Sanctuary Cities, Targeting Political Foes.” Well, I raised a very obvious question. Why would this be “targeting” them? Isn’t this what they want? Hasn’t Pelosi called illegal aliens “little gifts of love”? And doesn’t San Francisco house a bunch of illegals, happily so, in sanctuary cities? “How could this be targeting anybody?” I said. “Why don’t they welcome them? “Why aren’t sanctuary cities calling the White House and saying, ‘Finally, we’re on the same page. We’ll be glad to take them. We will happily take these little gifts of love’?” I went through 20 minutes of this pointing out the sheer hypocrisy. “How in the world can this be a bad thing? Sanctuary cities love sanctuary cities. They love themselves. They love illegal immigrants. Pelosi calls ’em ‘little gifts of love.’ How in the hell can flooding sanctuary cities with illegals be ‘targeting political foes’ unless they don’t really want them? Tweet two, 12:38: “….The Radical Left always seems to have an Open Borders, Open Arms policy — so this should make them very happy!” So my emailer says, “Is he listening to you? This is incredible,” and then he sends these tweets out 20 minutes after I make the comments. It really is the only logical conclusion you can make. How can this possibly be an imposition? How can giving something or somebody these places eagerly want…? How can that be “targeting” them? How can it be a dirty trick? How in the world can it be something that would be written about derisively in the Washington Post? Shouldn’t they welcome them? As I say, the Washington Post should get a Pulitzer for uncovering the strategy! “Donald Trump: William Barr’s Spying Claim Is Absolutely True.” Now, we touched on this yesterday, but it’s worth revisiting. Because think about it. It is left to President Trump to point out that it is a big deal that the Obama administration was spying on a political opponent. Whether Comey wants to call it authorized surveillance, court-ordered surveillance or however he wants to pretzel himself here into some embarrassing position, nobody in the Drive-By Media thinks it’s a big deal. In fact, the Drive-Bys think the outrage is accusing the FBI of spying. Meanwhile, they’re out there accusing Trump of being a spy, they’re accusing Trump of being a traitor, they’re accusing Trump of being a Russian agent — and apparently there’s nothing wrong with that. But Barr saying he thinks the FBI was spying on the Trump campaign? “Well, that’s so beneath the pale, that’s so undignified, we think it’s outrageous,” they say. You know, I haven’t found a whole lot of Republicans who think it’s a big deal. This is a huge, huge deal. You know, we’re told the crime of Watergate was Nixon spying on the DNC. Isn’t that what they told us it was? “Nixon was spying on the DNC. He sent the Plumbers over there to set up wiretaps in Larry O’Brien’s office at the DNC in the Watergate. Nixon was spying, and now here comes the FBI and Brennan and Clapper — let’s just name names — spying on Trump and his campaign and that’s a ho-hummer? Let’s go to audio sound bites. We’ll start here at number 5. This is, again, a guy in a golf shirt running the country. RUSH: Go ahead and put it up on the Dittocam. This is the map as of March 18th, sanctuary cities and counties in the United States. That’s probably more than you thought. There’s a couple in Kansas City. There’s one in St. Louis. Three of them down here in south Florida. East Coast and the Left Coast, pretty much the whole state of Seattle looks like a sanctuary state, Oregon as well, Northern California, San Francisco Bay area down to LA and San Diego. And New Jersey, Connecticut, Long Island, Massachusetts. It’s incredible. These are the places there are sanctuary cities and sanctuary counties, and including sanctuary states, as of March 18th. And Trump did tweet, 12:38, that they’re thinking of sending illegal aliens who are currently being detained to some of these locations. The Washington Post got hold of it, thinks it’s a dirty political trick that Trump is targeting his political enemy. You know, speaking of this, before the program started I have CNN’s on it here, and John Kasich was a guest. They asked him about this. And he sat there, he shook his head (imitating Kasich), “I don’t know, I just don’t know. I don’t know. I really don’t know. It just looks like our political institutions are failing us in full. I don’t know, uh, how anybody could think this way.” It’s a brilliant idea. And Trump’s 12:38 p.m. tweets make it look like it’s active. RUSH: Hey, this looks like it’s the real deal. Breaking news here. 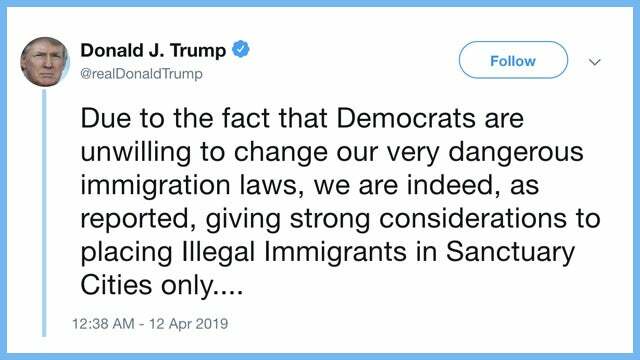 Trump confirms he’s giving strong considerations to placing illegal immigrants in sanctuary cities. President Trump responded to reports Friday that his administration proposed releasing immigrant detainees in sanctuary cities by not only confirming the plan but saying it remains under strong consideration. It is a story! Trump knows his base will love this whether they do it or not. But to have the Washington Post write about it, “No, no, they were not thinking” — the Washington Post did two things. They write up a headline making it look like Trump really is considering it, and it is the epitome of a dirty trick, it’s just so slimy. How dare Trump even think of targeting his political enemies. And then in the eight or ninth paragraph in the story, the Washington Post says it’s not a serious thing, it was just some idea being bandied about. And now Trump is out tweeting and letting everybody know that it is a serious thing, that he is giving it serious consideration. And, folks, I’m telling you, it is brilliant. It is a brilliant idea. It is so brilliant, it deserves follow-through. I can envision it now. We need to actually either assemble a little multiple airplane caravan or bus caravan and grab about 50, maybe a hundred illegals and drop them in San Francisco and Portland and Seattle. Put a red ribbon or something on the bus. Donald Trump is gifting sanctuary cities with gifts of love. Call it the Pelosi Gift of Love Express. I’m telling you, this is brilliant! It is absolutely brilliant. It would accomplish so much. I really hope this happens. And even if it doesn’t, I hope it is at least serious enough to be given serious consideration that would be reported as serious, that would include planning suggestions, ’cause it’s brilliant. This is exactly the kind of thing Trump did during his campaign that had everybody, Republican and Democrat, stymied and confused and off balance. Give the left what they want. Cross the aisle. Work with them. Help alleviate some of the pressure at the border. We’ve got overrun detention centers. We’ve got California willing to take all the illegal immigrants they can get. They oppose doing anything to close the border. All these sanctuary cities and states oppose doing anything to reduce illegal immigration. It must mean that they want to help. I could write this. I could put this policy together. It must mean that they really do want to help, and they’d be more than willing, as an act of patriotism, to help alleviate the pressure at the border by taking an additional 15 illegal immigrants in every sanctuary city in California, in Portland, Oregon, and in Washington. What an act of patriotism. These states working together with President Trump for the first time in his presidency to accomplish a mutual objective to relieve pressure at the border. And all these sanctuary cities and states would have to do is nothing! They just have to continue with existing policy. Just stand there with their arms wide open as the Pelosi Gift of Love Express bus drives into town. Even have some welcoming committees out there. “Here’s your driver’s license application. Here’s your voter registration application. Here’s your health insurance card. Here’s what school to take your illegal kid to when he’s born.” And do a whole, big ceremonial thing upon the arrival in these sanctuary cities of these illegal aliens who are being deposited to alleviate the pressure on the border. It’s a win-win. It’s a win-win for everyone. I would even go on one of the busses. I would donate a bus. RUSH: Here is Josie in Pensacola, Florida. I’m glad you waited. You’re on Open Line Friday. Hi. RUSH: (chuckles) Well, welcome. It’s great to have people excited to be here! CALLER: Yes. Yes. First of all, I’m a legal Latina that came to America 47 years ago, and I’m disgusted with the Democrat Party, what they’re doing to the American people, including to me personally. Sanctuary cities? We need to bring all the illegals to their town, bring ’em to Hollywood. Bring ’em to Nancy Pelosi’s mansion if she loves illegals so much. RUSH: So you like the idea, you think it’s a great idea that…? CALLER: Yes, it is. Yes. It is not fair that I had to spend almost eight years trying to become a U.S. citizen, came the legal way, and these people are getting everything for free. I know a lot of stories. I know a lot of people personally who did this. RUSH: You know, people like you… People like you are the great, unreported, significant portion of our immigrant population. RUSH: The ones who did it legally, the ones who followed the law, followed the regulations, went through the citizenship test and everything — and God bless you and more power to you. And it has to be something that makes you mad, incenses you as you watch this, the Democrat Party making these emotional pleas, these claims that (sobbing), “For compassion alone, we need to let these people in! “My God, it’s horrible what we’re doing. We’re betraying our values!” Blah, blah. It’s gotta tick you off. I’m glad that you called. Folks, I’m telling you this idea to send overcrowded detention center detainees to sanctuary cities is a brilliant idea, and everybody in Trump’s support base is gonna be all for this. You know why? People are gonna understand every aspect of it. They’re gonna understand the brilliant politics of it — and you can’t deny that. They’re gonna understand the brilliant policy aspects of it. I did get an email from somebody. “Rush, I don’t understand. Why would you make these places even stronger by willingly sending more people there that they’re just gonna turn into Democrat voters at some point?” Well, see, that is happening anyway. The purpose here is to call ’em out. They already are. The Washington Post is doing a story. (paraphrased) “This is a dirty trick!” What’s dirty trick about it? Sanctuary cities, you love doing what you’re doing. What could…? More sanctuary city denizens? How could that possibly hurt if you really believe this? Anyway, I don’t know if it’s gonna happen, but I get the impression (there have been two different news stories today) that Trump is going to make sure this has a lot of legs, a lot of life to it — and that alone is going to be worth it. 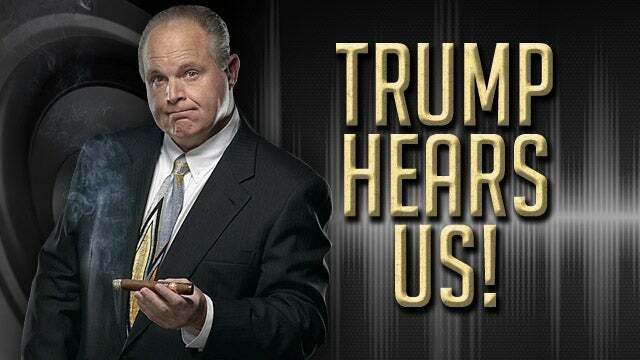 RUSH: I just heard the president selling his program to put illegals in sanctuary cities. He said, “Hey, they got open arms, they want more, they say they’re perfect place. Well, we have a lot we could give ’em.” You know, I love it.